Yes, George Coll loves his two pack llamas and fondly referred to as “the boys”. They act aloof but love to pack his painting and camping gear into the high country of Colorado and Wyoming. Each summer they go into the Wind River Mountains of Wyoming or the Colorado wilderness areas on the continental divide to capture the essence of Western plein air paintings. He carries custom made boxes able to transport wet paintings being packed by the llamas. Being in the high country with “the boys” is one of the best events of being a painter, for George. George lives west of Loveland, Colorado, with his wife Jennifer of more than 35 years. In 1993, they purchased their two-acre property with a 1920s-built-home, a barn and several outbuildings that include a studio he built in 1999. George, now in his early sixties, paints every day and supports himself through his art. 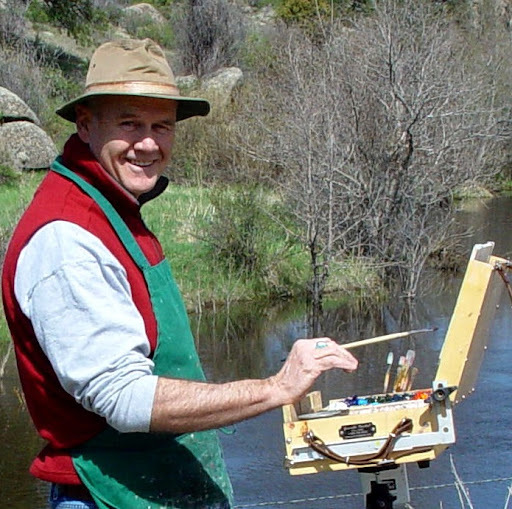 The beautiful Northern Colorado countryside and the many people who share his life inspire his painting. George is a Renaissance man whose talents include furniture and cabinet making. His home is adorned with his handcrafted furniture, cabinets, two looms and numerous paintings. “I always believed I had the ability to draw, which is the foundation of my desire to paint,” he says. George started painting with watercolors in 1986 at the Denver Art Students League. In 1998, he focused on oil painting. When he asked his first oil painter instructor “how to get good quickly” she said to paint from life whenever possible. Developing drawing skills and painting from life are the guiding principles of his daily painting routine. George works from life. His models sit for him until completion. His landscape paintings are composed on location to capture the essence of light. His larger landscapes are completed in the studio from his on-location field studies. George is known for his landscape “road trips,” taking him often to neighboring states to capture a three-hour segment of light. He enjoys surprising his painting companions by taking impromptu excursions that often end in the neighboring state of Wyoming.